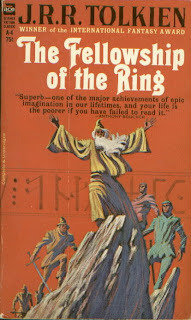 Following up on last week's Hobbit post, the Book of the Week is the first American paperback of The Fellowship of the Ring by J.R.R. 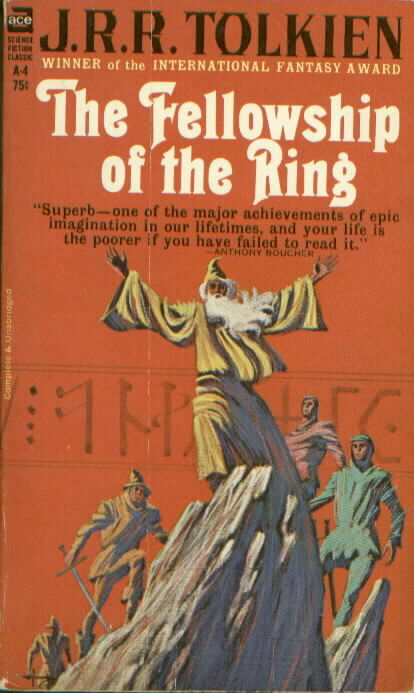 Tolkien, with cover art by Jack Gaughan. This is the infamous "pirated" edition, released by Ace Books in May 1965. Ace initially did not pay Tolkien or his British publisher for the rights to Lord of the Rings, believing the books had unwittingly fallen into the public domain in the United States, due to the excessive number of copies imported here from Britain. (The validity of Ace's position apparently turned on whether one considers a book bound in the U.S. containing pages printed in the U.K. to be an imported edition.) Thus, the Book of the Week contains no copyright notice at all. Ballantine subsequently published the authorized (and revised, so as to resurrect the copyright) paperback editions and launched a public relations campaign against Ace, with Tolkien actually comparing Ace Books to his villain Sauron. Ace relented and agreed to pay Tolkien for its edition and not to print further copies, thus assuring that the Ace editions would become the copies coveted by subsequent collectors. Next week: the Ace edition of The Two Towers. My Story Recommendation of the Week is for "The N-Body Solution" by Sean Williams, the second SROTW from the anthology Armored, edited by John Joseph Adams. The best science fiction can inspire awe with galaxy-spanning concepts, while simultaneously pulling the reader into the story through the characters' personal dramas. "The N-Body Solution" is a wonderful example. "The N-Body Solution" is set far in the future, as we learn on the opening page, when the first-person narrator Alex enters a bar to get "as plastered as the ancients," and describes the place as containing "humans, sub-humans, post-humans, poly-humans——every category I'd ever heard of, plus some types that probably weren't human at all." At the heart of the story is "The Loop," a series of matter transmitters left behind by a vanished alien race, which allow you to step from one world directly onto another. Each transmitter, however, is one-way; you cannot turn around and retrace your steps. But the name "The Loop" implies that if you keep going forward, eventually you'll come back to where you started. Except that on Cyernus, Loop Junction 163 is broken. It appears to be in working order, but when you step into the "wormcaster," you're still on Cyernus. Cyernus is a dismal little world, and people who expected to have a whole galaxy ahead of them to explore do not react well to finding themselves trapped there. The suicide rate is high. On Cyernus Alex encounters Enforcer Ei, who has a female voice, but it's hard to know for sure, since she never removes her powerful mech suit. The failure of Loop Junction 163 affects Alex and Ei in a similar way——it keeps them from outrunning their pasts. The ultimate explanation for what has gone wrong with The Loop is simple and elegant, one of those things that seems immediately obvious after you learn what it is. Equally important, the character development of Alex and Ei, and how their encounter plays out on an individual level, is most satisfying. Sean Williams is perhaps the most decorated Australian author of science fiction and fantasy ever, with eight Aurealis Awards and seven Ditmar Awards. He is equally adept writing solo work, collaborations, and media tie-ins (his Star Wars work has hit #1 on the New York Times best-seller list). He is also a favorite of our book group after hanging out with us late into the evening one night during the Denver Worldcon, as we discussed his outstanding novel The Crooked Letter. "The N-Body Solution" demonstrates that, even after 35 books, the quality of his writing remains as strong as ever. The Book of the Week is The Hobbit by J.R.R. Tolkien. I used to do "Book of the Week" posts highlighting some of the volumes from my personal book collection, in which I take absurd pride. I ran out of gas (but I sure as hell didn't run out of books) about three years ago——click on the "Book of the Week" tag if you want to sample some of the old posts——but I felt compelled to resurrect the Book of the Week today, when I read that this is the 75th anniversary of the original release of The Hobbit. As any regular reader of this blog (and pretty much everyone else) already knows, The Hobbit is one of the most beloved classics of modern fantasy, and its author J.R.R. Tolkien arguably the most important fantasist of the Twentieth Century. Sadly, I wasn't around in 1937 to pick up the first edition of The Hobbit, which now runs to tens of thousands of dollars on the collectors' market. But I'm pleased at least to have the first American paperback, published by Ballantine Books in 1965, cover art by Barbara Remington. Note that this cover has very little to do with the story of The Hobbit——you will search the text in vain for any mention of the ostrich creatures or the goofy-looking lion that appear on the front of the book. Tolkien particularly disliked the lion, and at his request it was airbrushed out of later printings. 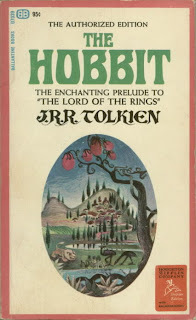 Artist Barbara Remington had not yet read The Hobbit when she did the cover. This is not quite so irresponsible as it sounds; Ace Books had recently beaten Ballantine to the American market with unauthorized paperback editions of the Lord of the Rings trilogy, and Ballantine rushed The Hobbit to press so as to forestall another pirated Ace edition. For the next Book of the Week entry, I'll show you the unauthorized Ace edition of The Fellowship of the Ring. This battle, the last one in first round of the Summer 2012 Battle of the Books, features Casting Shadows by J. Kelley Anderson going against The Mongoliad: Book One by Neal Stephenson, Greg Bear, Mark Teppo, E.D. deBirmingham, Erik Bear, Joseph Bassey and Cooper Moo. The winner will be whichever book I most want to keep reading after the first 25 pages. 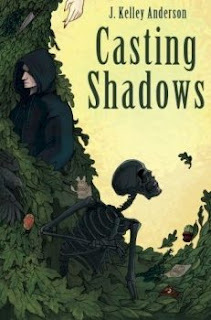 Casting Shadows: World Castle Publishing, trade paperback, 230 pages, February 2012, cover art by Rhea Ewing. J. Kelley Anderson is a US writer. Casting Shadows, his first novel, is a contemporary, dark urban fantasy. The first 25 pages covers a little over three chapters. Edward Kelly, who is in his mid-twenties and living in a small town in Ohio, apparently wanted revenge for the murder of his sister and the deaths of his parents, so he got involved in malevolent magic. On a rainy night, Edward summons a servant into a body buried in the local cemetery. The creature becomes a black skeleton with dark flames in his eyes. Edward calls him Vincent. Edward orders Vincent to kill the cemetery groundskeeper and his wife. But Vincent does nothing because he senses that Edward didn’t really want to hurt them. The groundskeeper thinks Edward is acting weird so he calls the police. Edward walks home with Vincent following. Edward is surprised that skeletal Vincent can talk to him telepathically, and is amazingly rational. Police Officer Michael Miller drops by Edward’s house and cusses out Edward for being in the graveyard. The policeman, Michael, is an old school buddy of Edward’s, and probably his only friend. Edward needs to contact Seth, his unseen black magic teacher. Edward lights ritually prepared logs in the fireplace. Edward communicates with Seth through the fire. Seth is upset that Edward didn’t start a killing spree. Seth attacks Edward with blue flames. Vincent rescues his Master and battles Seth. When Edward is knocked unconscious, he dreams of two young girls and their grandmother. The grandmother has a skeletal helper that looks strangely like Vincent. The Mongoliad: Book One: 47 North, trade paperback, 448 pages. The Mongoliad was originally released in a serialized format online. Two more books are forthcoming in the series. Neal Stephenson and Greg Bear are authors well known for their many works of speculative fiction and science fiction. Mark Teppo is the author of an urban fantasy series. E.D. deBirmingham has written historical fiction. Joseph Brassey teaches medieval fighting techniques. Erik Bear has written for a video game and Copper Moo has written magazine articles. The first 25 pages covers a chapter and a half. The year is 1241, months after the Battle of Legnica where the armies of Christendom were decisively defeated by the Mongols. Near Legnica, which is now in Poland, a woman messenger/spy spots a group of men near the ruins of a monastery. They are training with swords and bows. They appear to be the knights of Shield-Brethren whom is she is seeking. She is cornered by their sentries. Feronantus, an older man who seems to be in charge, recognizes her as one of the Bindings, not a Mongol. She informs the men that Illarion, a friend of theirs, is hurt and she can lead them to him. Meanwhile, in Karakorum, the capital of the Mongol Empire, Ögedei Khan, Khan of Khans, the third son of and successor to Genghis Khan, is in his palace. His brother Chagatai Khan has sent an emissary because he’s rightfully worried about Ögedei’s drinking. Ögedei tells his wives that he dreams of riding a strong pony across the grassy steppes instead of talking to an endless parade of bureaucrats and court officials. The Battle: Casting Shadows had a uphill battle against The Mongoliad: Book One. In Casting Shadows, Edward abuses someone’s grandfather's corpse to make a skeletal servant and has murderous thoughts. That’s not typical protagonist behavior, especially for a character that’s apparently not all bad. I think that more should have been done to explain what drove Edward down this evil path. If Edward was somehow brainwashed by Seth, that should have been better conveyed. The layout of Edward’s house was described in more detail than I needed. Edward’s dream sequence, which was presented without introduction and printed in all italics, was initially confusing to me. The Mongoliad, Book One in chapter one introduces an unusually high number of characters. There’s a fighter in monk’s robes, a hunter wearing animal skins, and a handsome knight in armor. There’s an Irishman, a man who looks like a Saracen, and men that by their names seem to be Hungarian and Norwegian. The woman messenger/spy apparently speaks, of all languages, Tocharian. The portion of chapter two that I read encouraged me to look up Ögedei Khan on Wikipedia. He’s a historical figure. Casting Shadows gave it a try, but it was simply outmatched by The Mongoliad. Even though I don’t know where the story of The Mongoliad is going yet, the writing is solid, the cast is interesting and I want to read more. 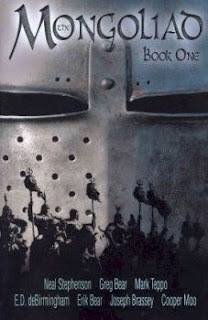 THE WINNER: THE MONGOLIAD: BOOK ONE by Neal Stephenson, Greg Bear and five friends. The Mongoliad, Book One will advance to meet The Land of Decoration by Grace McCleen in the second round. With Amy taking over the current Battle of the Books, I've had some time to catch up on my short fiction reading, which means the Story Recommendation of the Week is back for at least a few weeks. The first of our new SROTWs goes to Lauren Beukes for "The Green," from the anthology Armored, edited by John Joseph Adams. 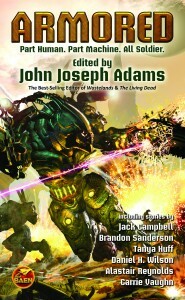 Armored is a Baen Books anthology involving future (well, mostly future) soldiers in powered battle armor. I'm not a big military SF reader, so I wasn't sure this would be my cup of tea -- I should have had more faith in J.J. Adams. This is a very strong anthology. While there is enough straight military SF in here to satisfy readers looking for that, Armored features a surprisingly broad range of different styles and approaches to the "armor" theme. More importantly, it contains a lot of terrific writing. I'm going to highlight two of the individual pieces here, beginning with "The Green." Green is the wrong word for it. You'd only make that mistake from the outside. When you're in the thick of it, it's black. The tangle of the canopy blocks out the sunlight. It's the murky gloom after twilight, before real dark sets in. Visibility is five meters, fifteen with headlights, although the light attracts moths, which get into the vents. Pollen spores swirl around you, big as your head. Sulfur candy floss. And everything is moist and sticky and fertile. Like the whole jungle is rutting around us. One remarkable form of native life is a type of slime mold that can animate the dead. Our characters' base is haunted by several of these reanimated corpses, which the corporate employer charmingly designates OPP's ("Organically Preserved Personnel") but the soldiers call Pinocchios. I love the voice of this piece. Lauren Beukes creates a miserable setting, but the story is still fun to read, thanks to our first-person narrator and her wise-guy 'tude. South African writer Lauren Beukes made a big splash with her first novel Moxyland, and her second novel Zoo City won the Arthur C. Clarke Award. She also writes for film, TV, comics, and non-fiction magazines, all of which we hope won't keep her from writing plenty more of her distinctive fiction. This second to last battle in the first round of the Summer 2012 Battle of the Books features The Land of Decoration by Grace McCleen going against Pure by Julianna Baggott. The winner will be whichever book I most want to keep reading after the first 25 pages. 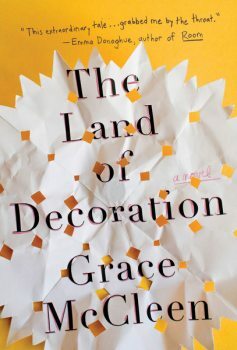 The Land of Decoration: Henry Holt and Company hardcover, 306 pages, April 2012. Grace McCleen is a UK author and singer-songwriter. The Land of Decoration, her first novel, won the Desmond Elliott novel prize for debut fiction published in Britain. The first 25 pages consists of nearly six unnumbered chapters titled by topic. Ten-year-old Judith McPherson builds a model of a land in her bedroom out of various bits and pieces. She calls it the Land of Decoration, after a description of the biblical Promised Land. She and her father are Christian fundamentalists living in Wales. They read and ponder the Bible every day. On the playground, bully Neil Lewis threatens to push Judith's head down the toilet, but then the school bell rings. Judith spends the next days of the weekend worrying about what will happen on Monday. She practices holding her breath, fearing her head will be pushed underwater. She wonders what dying is like and can’t eat much. She briefly considers telling her father, but she doubts he’d believe she’s in danger. On Sunday morning, Judith goes with her father to the Meeting Hall, which is a large metal shed. Her father’s congregation numbers about thirty, including some eccentric characters. They have a visiting speaker, Brother Michaels, who talks about faith moving mountains and miracles working best with ordinary things. Judith is very impressed with Brother Michaels, and afterword, asks him for some advice. 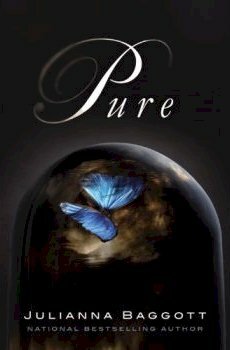 Pure: Grand Central Publishing, February 2012, 431 pages. Julianna Baggott is a critically acclaimed bestselling author who has written seventeen books, including novels for adults and younger readers, and collections of poetry. Pure is the start of a projected series. The first 25 pages consists of a prologue and a little more than two chapters. The detonations (nuclear bombs) occurred about nine years ago. Pressia was just six then and hardly remembers. The detonations caused many of the survivors to be melded with various objects. Pressia was holding a doll, and the doll's head became one of her hands. Her grandfather got a small plastic fan lodged in his throat. Pressia and her grandfather live in the back of a ruined barbershop. Pressia makes windup toy butterflies to barter. The local military regime, called the OSR, requires that all sixteen year olds turn themselves in or be taken in forcibly. Pressia will soon turn sixteen. Her grandfather has built Pressia a sleeping cabinet with a trapdoor to hide in. Meanwhile, there are other people, the Pures, who were protected from the damaging detonations inside their Dome. Partridge and the other teenage boys at the academy are subjected to "coding sessions" to give them new skills. Partridge is pulled out of a history class to meet with his father, Ellery Willux, a head scientist. Partridge is not at all close to his father. During their talk, his father implies that Partridge’s mother, who supposedly died helping survivors outside the Dome, may still be alive. The Battle: This match-up features two books marketed, more or less, as fiction. But the thing is, I (Amy) very rarely read mainstream fiction. Both books feature young protagonists. In The Land of Decoration, Judith’s father believes that it’s only a matter of time until someone blows the world up. In Pure, it's after the bombs have dropped. The Land of Decoration is contemporary fiction that, so far, lacks in any fantastic element. The book is told in first person in a quirky manner. Despite the young age of the protagonist, this book isn’t written for a YA audience. Judith relates some peculiar personal details about the people she encounters. Some of the fundamental religious aspects, which may be about Jehovah’s Witnesses, make me want to grind my teeth in dismay. Judith's worldview seems so by skewed her religious beliefs. Pure definitely has fantastic elements, but I found some of them to be unsettling, such Pressia’s doll head hand with the blinky eyes. This book, which has two teenage protagonists living in oppressive near-future societies, appears to be targeted at the YA audience. Yet it's a science fiction book with elements that don’t seem scientifically logical. Maybe it would have worked better for me if it didn’t mention real places, such as Baltimore and DC. I liked the jump rope rhyme of the children outside the Dome. For me, this battle is a bit of a toss up. Pure has the genre content, but the The Land of Decoration feels more emotionally believable. Both books are well written. Guess I'll pick to continue reading about the Christian pre-teen instead of the post-apocalypse teenagers. The Land of Decoration will advance to meet in the second round either Casting Shadows by J. Kelley Anderson or The Mongoliad: Book One by Neal Stephenson, Greg Bear & five others.